1. To ensure the success of your event all details including menu selection, room set-up, estimatednumber of attendees and any other specifics relating to your event are due 30 days prior to yourevent. 2. A 19% service charge applies to all food and beverage ordered through the Catering Department. Inaccordance with state law, 5.1% Wisconsin state sales tax is then added to the total amount. Groupsrequesting state tax exemption must submit their state tax exemption form at least two (2) weeksprior to the scheduled function. 3. A final guaranteed count is the responsibility of the client, to be given to the Resort by 12 noon, five(5) business days prior to the event. If the hotel does not receive the guarantee by this time, thebooking party will be charged for the full person count listed on the contract, unless the actualnumber of persons is greater. This guarantee is the minimum count you will be charged for andcannot decrease. Please notify the Catering Department as soon as possible if your count increases. 4. The Olympia Resort cannot be responsible for service to more than five percent (5%) over the finalguarantee. 5. Prices listed on menus are subject to change without notice. Firm food prices can be guaranteed inwriting sixty (60) days prior to the event, if requested. 6. Please choose one or two entrées only, per menu requirements. For additional entrée requests aboveand beyond menu requirements, please contact the Catering Department for applicable surcharges.Client must provide place cards to notify server of selection if more than one entrée is offered. 7. Buffet Dinners are prepared based on Final Guarantee of attendees. Buffet items will be replenisheduntil all guests in attendance have proceeded through the buffet line. Once attendees have beenserved, one Buffet Line will remain open for an additional 30 minutes to accommodate any latearrivals or second helpings. Buffet Items will not be replenished during this time. 8. Wisconsin health code states that no food or beverage items, which remain uneaten after the event,may be removed by the customer or its attendees. Serving any food and beverage on our premisesthat is not purchased from the hotel is also prohibited by state law. Wedding Cakes will be allowedwhen purchased through a licensed distributor. 9. Banquet and meeting rooms are assigned by guaranteed number of guests, as well as food andbeverage requirements. 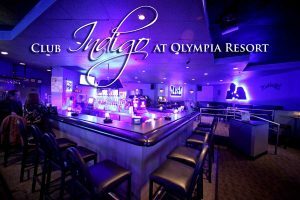 The Olympia Resort reserves the right to assign the facilities most suited tothe size and type of function being held. 10. Due to staffing requirements, catered functions of less than 20 people will be charged a labor fee of$25.00. 11. 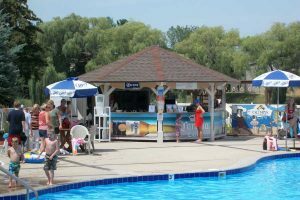 If a private bar is requested, and beverage consumption does not equal or exceed $150.00 per hour,per bartender, a $30.00 per hour charge, per bartender, will be assessed to the banquet check. 12. We do not allow affixing anything to our walls, floor or ceiling with tape, staples, nails or any othersubstance. Our Banquet Department will hang Banners upon advanced request for a nominal laborfee. 13. The Client agrees to the responsibility of any damage to the property or equipment by members,guests or outside groups contracted by client during the period of time functions are held at thehotel. The Olympia Resort reserves the right to immediately terminate service or occupancy in caseof violation of any laws, regulations or hotel policies. 14. Olympia does not assume responsibility for the damage or loss of any articles brought on premisessuch as decorations, wedding cake, cake and table accessories, card boxes, Audio-Visual, electronicequipment, etc. Security arrangements should be made for all items left unattended for any time. Itis the responsibility of the client to remove all personal items following the event. Items remainingthree (3) days following an event will be disposed of by the Resort. 15. 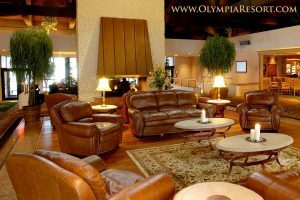 Olympia Resort must be notified in advance of special service needs for set-up of entertainment (ie:staging, electrical needs, etc. )which will be charged accordingly. Prices do not include 19% gratuity or 5.1% Wisconsin sales tax. Prices are subject to change.